Even if you’re short on time, you can enjoy Southern regional classic dishes that are big on flavor. These recipes are easy to prepare, using a slow cooker, and bring your family the very best in mouthwatering, Southern meals. 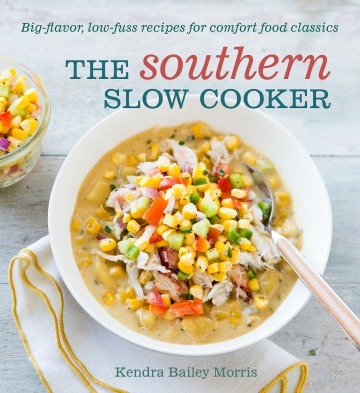 The Southern Slow Cooker: Big-Flavor, Low-Fuss Recipes for Comfort Food Classics by Kendra Bailey Morris, brings out the best in Southern cooking without the need to stay stove-side in the kitchen for long periods of time. That may seem hard to believe, but these tasty recipes were developed specifically for the slow cooker so you can make delicious meals in the time you have available. Southern cooking takes time, but the end result is worth every minute. The recipes in this book are based on Kendra’s family favorites — food that is comforting, hearty and rich in flavor. To keep with tradition, she uses seasonal, fresh ingredients like the original recipes called for, but she’s also made adjustments to these family gems. Kendra’s focus is still fabulous food, but these recipes are created so they can be prepped, added to the slow cooker and left to cook for hours. Perfect for families on the go. Follow Kendra’s recipes to feed six to eight people, or cut them in half to feed a smaller group with fewer leftovers. Take on the tips she offers, like suggested beverage pairings for most of the recipes, cooking tips that add a few steps to preparing some of the meals (well worth the efforts, she notes), tools to make cleanup easier and a short guide on Southern seasonings. Think of how amazing it will be to come home to warming soups, stews and chilies like Buffalo Stout Beer Chili or Smoked Ham, Potato and Rice Soup. Serve your family a fuss-free main dish like Meatloaf with Brown Sugar BBQ Sauce or Pork Loin Roast with Rosemary, Balsamic Vinegar and Vanilla Fig Jam. Present sides like Sausage-Stuffed Acorn Squash or Buttermilk, Corn and Chive Spoonbread. And who could resist mouthwatering desserts like Gingersnap Peach Upside-Down Cake or Chocolate-Banana Cheesecake in Jars. Even if you’re short on time, it’s possible to prepare a Southern-style, mouthwatering meal. This hearty, slow-cooked, tomato-based dish gets its name from the long-grain rice that is blended into the meatball mixture, giving it a quill-like quality. This is comfort food at its finest and an ideal cold-weather meal. 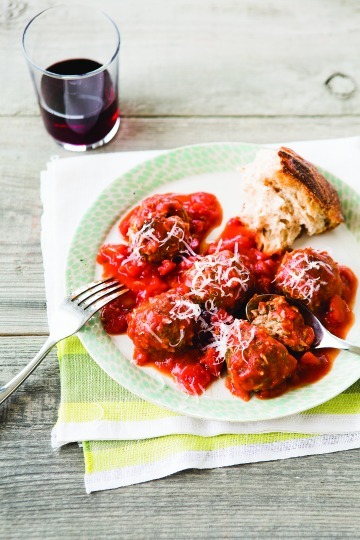 Serve these delicate meatballs topped with grated Parmesan alongside a green salad and a wedge of crusty bread for soaking up any leftover sauce. For an amazing second-day meal, you can make meatball subs: Just spoon some warm meatballs into sub rolls, top with provolone cheese and broil until the cheese melts. The meatballs are different from traditional Italian meatballs. They are more fragile, so avoid stirring them too much, or they’ll fall apart. If they do break apart, no worries, just serve them over mashed potatoes, which is another great combination. To make the sauce, add both cans of tomatoes, the tomato juice, tomato soup, water, Worcestershire sauce, sugar, oregano, dried parsley and bay leaves to the slow cooker and stir well. To make the meatballs, mix together the beef, rice, onion, milk, egg, Worcestershire sauce, horseradish, garlic, basil, oregano, salt, pepper and celery salt in a large bowl. Gently form into round balls 1-1/2 to 2 inches in diameter. Heat a large saute pan on the stove top over medium-high heat. Add the olive oil. Add the meatballs and brown well on all sides, about 5 to 7 minutes. When the meatballs are all browned, add them to the slow cooker along with the pan juices. Stir gently once or twice until all of the meatballs are coated in sauce, being careful not to break them up. Cover and cook on low at least 6 hours, and up to 8 hours. If you would prefer a thicker sauce, set the slow cooker to high and uncover it for the last 30 to 45 minutes of cooking or until the sauce is thickened. Season with salt and pepper. Remove the bay leaves. To serve, spoon the meatballs and sauce into individual serving bowls and top with fresh parsley and Parmesan cheese. Kendra Bailey Morris is a cookbook author, food writer, recipe developer and television host. Her writing appears in Better Homes and Gardens, NPR’s Kitchen Window, CNN’s Eatocracy, Saveur, Richmond Times Dispatch (where she was a food and recipe columnist for four years), the Associated Press, Washington Post, and Richmond Magazine. She served as a judge for the 2011 and 2013 James Beard Awards and has a master’s degree in creative writing from Virginia Commonwealth University.